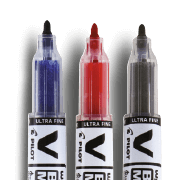 The forefront of qualityWith their fine or extra-fine tips, V Board Master S markers give you precise lines, while holding up under pressure to the very end! 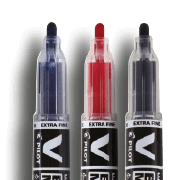 Their bright black, blue, and red ink erases easily without leaving any marks on the white board. Fine body and spiritV Board Master S markers are sharp and agile. They fit comfortably even in small hands so that everyone's spirit shines. 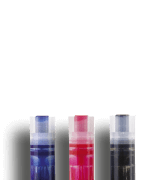 Refillable to last longerEconomical and environmentally-friendly, V Board Master S markers refill easily to keep writing, and writing, and writing... consistently down to the last drop of ink.